The largest and most revered design fair in the world begins today in Milan, also known as the Salone del Mobile Milano. Famed designer Tom Dixon has called it the “Glastonbury of design”. The annual design forum sees a quarter of a million people come through its doors every year, covering an estimated 230,000 square meters. It takes over the city running until the 9th April and brings together the world’s most innovative designs including offerings from well-established designers and an introduction to new and up and coming designers and this year we can expect a focus on sustainability and technology in the field of design. For its 56th edition, the fair was opened by Italian president Sergio Mattarella, confirming its importance on the cultural circuit. Marking the worldwide debut of this new design object from Danish quality audio brand Bang & Olufsen, they will be sharing a new sound product that intends to challenge and question impaired quality of audio you hear at home in the office in the form of a design object. If you’re interested in the future of food, then this years exhibition will also wet your appetite. There’s even an installation around the Future Sausage exploring alternative recipes for your next barbecue. To celebrate their 70th anniversary and long-term commitment to design and innovation, LG will be appearing in Milan for the first time. 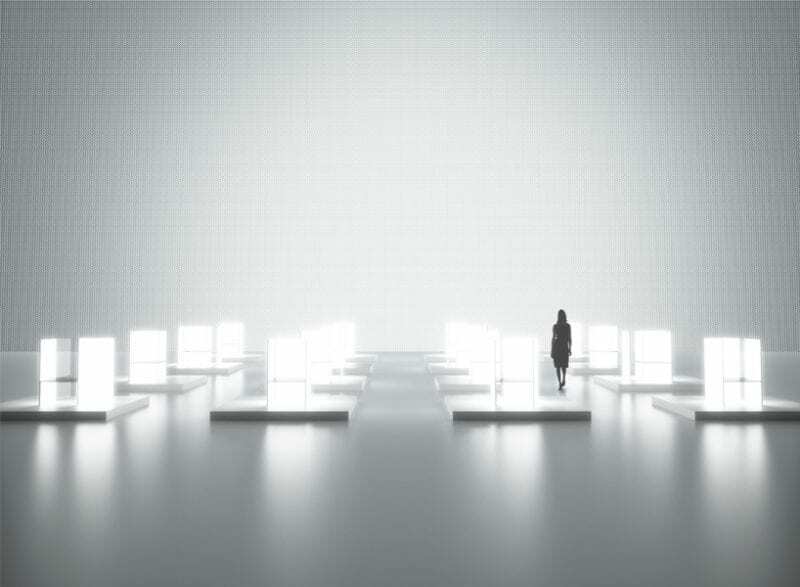 They have teamed up with Japanese designer Tokujin Yoshioka for a huge light installation. S.F._SENSES OF THE FUTURE is an immersive experience filled with light and everyday objects to promote both LG and Yoshioka’s optimistic view of the human experience. Technology has now managed to find its way into interior design. Fuseproject, the studio of Yves Béhar, has created a television in collaboration with Samsung called The Frame. This smart TV is designed to ‘disappear into the décor’, and the effect looks no different to a hanging frame of art. In this way, when not in use as a television, the frame displays a work of art or photograph of the owner’s choice, so as not to leave the ‘black square’. This TV reacts to changes in light and to movement, so turns off completely when no one is in the room to appreciate the art. Pretty smart. This year Danish brand Kvadrat, the leading manufacturer of design textiles, combines their effortlessly stylish approach and boundary pushing techniques together with Really, a new ecological brand answering the global problem of waste. The project uses material waste to create design-led furniture, such as these benches by Max Lamb. ‘Minimalism, modernity and a delight in interesting materials’. This was the joint ethos behind the collaboration between Scandinavian high street staple COS and London-based design duo Studio Swine to present New Spring, a six metre high tree like structure that emits vibrating vapour bubbles to then dissolve into white mist. Visually stunning, Studio Swine took their inspiration from the palazzos of Milan with blown glass. The interactive installation is made from recycled scaffolding metal, continuing the focus on sustainable materials.